Property Location With a stay at Quality Inn in Orange City, you&apos;ll be close to Blue Springs State Park and Victoria Hills Golf Club. 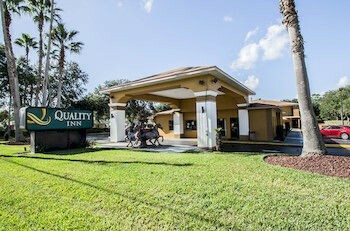 This hotel is within the vicinity of Hontoon Island State Park and Colby-Alderman Park.Rooms Make yourself at home in one of the 60 air-conditioned rooms featuring refrigerators and microwaves. Complimentary wireless Internet access keeps you connected, and cable programming is available for your entertainment. Conveniences include phones, as well as safes and coffee/tea makers.Rec, Spa, Premium Amenities Enjoy recreational amenities such as a fitness center and a seasonal outdoor pool. Additional amenities include complimentary wireless Internet access and gift shops/newsstands.Dining A complimentary buffet breakfast is included.Business, Other Amenities Featured amenities include complimentary newspapers in the lobby, a 24-hour front desk, and coffee/tea in the lobby. Free self parking is available onsite.